This is the second in a three part series on revamping your wardrobe, frugally. You can read the first part here. What is a frugal wardrobe? Is it many inexpensive clothes? Clothes bought from a thrift store or made yourself? Spending money on quality pieces to last a lifetime? The answer to the question depends on you. There are those that argue in favor of buying high quality classic styles and wearing them for many years. That tends to be the case of the older generation in France. On the other hand, the argument can be made that your clothes might tend to look dated after a while, even the classic styles, even for those who are not fashionistas. Some others might feel that a frugal wardrobe is bought inexpensively, given that they are hard on their garments and need to replace them often. Last week I talked about the different categories of clothes: from grungy to little black dress. I mentioned that I most need dressy casual clothes and nice business clothes. For me that translates into nice jeans or loose leggings paired with solid t shirts or, for nicer wear, slacks and button downs. I also want to have enough clothes to be able to get through one week without doing laundry: this means 4 pairs of nice pants, two pairs of casual pants, 6 nice tops, 6 casual tops and two skirts. I’m lucky to have all these items and more. If I take good care of my clothes, I’ll be set for a while. Along with the classic ‘essential’ elements, I also rely heavily on some favorite accessories. The most versatile element in my closet, for example, is a scarf that my mother bought for me about fifteen years ago. It is long and skinny, woven of different colored and textured ribbons and threads. What makes it so versatile however is the combination of colors- blues, greens, browns, grays and blacks and one strand of burgundy. It goes with every item of clothing I own; I can wear it any time and any place. Remember those questions from last week? Does it fit into one of the categories of clothes I need? They’re not only appropriate questions to ask when evaluating the current state of your closet, they’re also good to ask when thinking about which clothes to buy. My frugal wardrobe is a mix of both inexpensive and quality. But I love everything in it, especially those staples of my wardrobe that fit into the two main categories. I also no longer buy things that don’t look good on me, because I think they might fit one day, or are a really good price or are the latest fashion or maybe I’m just bored. I tend to buy classic styles, in few colors. I have some nicer items passed down from my grandmother, otherwise I shop at H+M and the thrift store. But what should you have in your frugal wardrobe? Breaking Even has a fabulous ten part series on the ten essentials in any woman’s wardrobe. Nicole models examples from her own classic in at least three different ways for each piece, showing its casual, business and dressy sides. While I don’t agree with all her choices (I’m not a big fan of graphic t shirts, for example) this series highlights the benefits of buying quality pieces of clothing and wearing them inventively. WiseBread shows how to dress for success and still spend less. This post also highlights how to wear clothing creatively in order to maximize the use of each item. My favorite tips refer to jackets: for example, wearing a button down shirt as a jacket or choosing one great jacket and then buying several bottoms to go with it, instead of looking for classic suits. The Art of Frugality shares her secrets to getting a killer wardrobe. My Daily Dollars goes shopping. I love her tip about buying new clothes together, so they’ll go together. Sarah at Lifestyles of the Organized talks long term clothing management. What is a frugal wardrobe for you? What kinds of clothes do you have in your closet? This is the second in a three part series appearing each Monday. You can read the first part here. 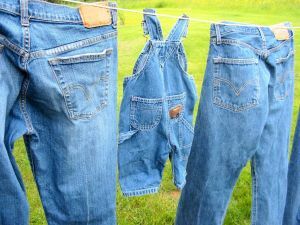 Next Monday we will look at how to take care of your clothes, frugally. Stay tuned for the next installment, or better yet, subscribed! Edited to add: you can read part three here. I love the idea of having some highly versatile clothes in your wardrobe! For you it’s a scarf, for me it’s a casual tan-colored jacket I can wear over most blouses to fancy them up a little. I also agree that buying higher-cost items can be more worthwhile in the long-run…high quality can definitely last longer. There have been times when I’ve said to myself, “well, I guess I got what I paid for” after I bought something for cheap and in turn it starting falling apart way too soon. I have recently come to the conclusion that it is a waste of money to buy “throw-away” quality clothing. I have some Lands End tops that must be at least 4 years old, and I’ve worn them once a week most weeks for that time. They still look TERRIFIC! I have tops from Kohls from last year that look awful. It is just worth the extra money for the quality stuff. I have had great luck at our thrift store and consignment shops buying new or nearly new quality pieces (and I’m don’t mean designer, I mean Lands End, LL Bean, Talbots, Coldwater Creek, Rugged Bear (kids), etc) at awesome prices. I love getting the bargain, and the beautiful clothes to boot! TheRoadtoHobbiton´s last blog post..What’s most important to you? I’ve been moving into the “spend a bit more for something nicer” camp over the last few years. I also try hard not to buy ANYTHING I don’t really love right from the start. Stuff I compromise on usually ends up at the consignment store, regardless of how much I paid for it. I have a mix of good quality and what I call disposable clothes. All my outerwear is of the best quality I can afford. My downfilled jacket and sheepskin lined leather boots will keep me warm for years and worth the investment. But I buy inexpensive t’shirts and my jeans at the thrift store, because I am hard on those items and have to toss them out after a couple of years no matter what the original cost. I don’t buy a lot of clothes, period. I’m still wearing some good tunic style tops that I bought in the mid 80’s (no, they’re not neon colours or wildly cut and they don’t have shoulder pads!). In fact when I occasionally wear them with their matching slim just below knee length skirts I *always* get compliments. But when I do buy something new I tend to one extreme or the other. I buy at least one inexpensive skirt per year. I pay $10 for a long, broomstick style skirt with elastic and drawstring waist. Right now I have 3 in good shape (and a couple of others only fit for wearing while cleaning the house). I also occasionally go to a place that clears out designer clothes. I got a Liz Claiborne tshirt and long denim skirt, plus a DKNY tshirt. The shirts (with long or 3/4 sleeves) were about $20 to $25 each and the skirt was $30. And I got 2 Tommy Bahamas tshirts with 3/4 length sleeves at 75% off (about $25 each, not from the discount place, just on the marked down rack at Tommy Bahamas). I would never pay full price for designer clothes but I’m happy to wear them when I get them for the same price as one from Zellers/Kmart! Plus they last for a lot longer than cheaper ones. What really, I mean really bugs me is when I decide to go for the expensive stuff (yes, I admit, it happens sometimes) – I automatically expect quality – but it’s simply not there any more. Those expensive clothes look like absolute crap after I washed them a few times, it is ridiculous. So why pay more if you end up with less? I also agree with buying quality clothes that you can wear for a long time. I figure if I love it– I’ll wear it enough to get my moneys worth. I’m interviewing this week and I realized that I hate my old suit. Something about it doesn’t fit right anymore and it just feels altogether wrong for me. So I went out looking for a blazer that will compliment my best pair of dress pants. I was able to find one that looks good with a bunch of my blouses and my best dress pants as well as with my nice jeans and some other blouses, even a t-shirt.